The EP is making a range of tools available to make it easier for the media to cover the European elections on 25 May. The results and other relevant information will be available in open data format, enabling the media, bloggers and interested users to automatically retrieve the raw data and publish it directly on their online platforms within seconds. The service gives news platforms the possibility to use self-defined filters and present the data in whatever way and design they want to, for example to generate graphs and illustrations. 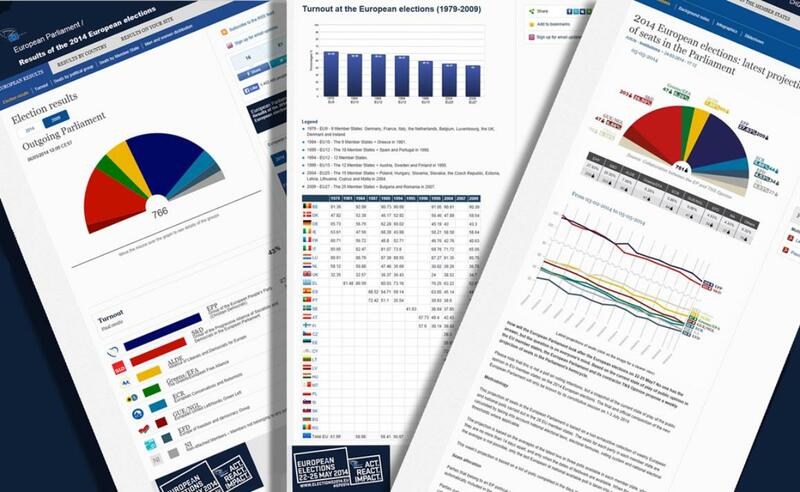 The data offered in open format includes EU-wide and national election results for both 2009 and 2014, turnout, seats by political group and member state, and the number of male and female MEPs. Also the names of the political groups are available in all of the EU's official 24 languages. The widgets and XML files are available to the general public, while the web services can only be used by the media. Any media interested in receiving the results as open data through the web services, can contact the Parliament's webmaster unit by writing to them at webmaster@ep.europa.eu. To make sure the service is fully operational on 25 May, it will be tested with participating media on 19 May. Media who want to participate can email the webmaster unit at webmaster@ep.europa.eu until 17.00 CET on Thursday 15 May.